I WAS in central Birmingham from about 2pm on Tuesday, and it seemed like business as usual despite a heavy police presence. Although everyone seemed a little wary the area was crowded and a return of violence seemed unlikely. At 5.30pm I saw lines of riot police mobilising outside the Mailbox, then I headed over to New Street where a big crowd of about 200 people were smashing the windows and doors of Watches of Switzerland. The crowd was almost all young people, many with masks and hoods. After a while riot police charged and dispersed the crowd, but they were outnumbered and could do little more than scare them off. Police blocked New Street, forcing everyone to go around. Ten minutes later I found the crowd again on Corporation Street, where they smashed a window of House Of Fraser before being run off by the police again. The police brought out dogs and set up lines around Colmore and Corporation Street but seemed confused as to exactly what to do, they were clearly scared by the numbers. The crowd moved to Martineau Place and smashed through a window of Sainsbury’s and looted mostly alcohol. Police were on Corporation Street but not in enough numbers to advance, or perhaps they hadn’t received orders to. Non-rioters were visibly scared and running away, police finally charged again and the crowd ran to High Street. The police’s tactics seemed to be to disperse crowds and close off that street if they had the numbers, but the rioters moved onto a new area. 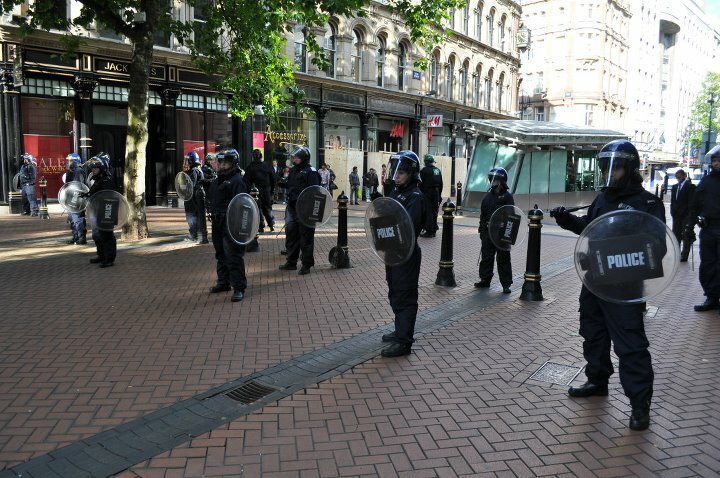 On High Street rioters smashed and looted Marks & Spencer, while police set up lines around the Bullring. Rioters started to attack McDonald’s but were run off again down an alleyway. From there they threw bricks, bottles and rubble at the cops. After this they were all over Moor Street, smashing windows in bus stops and throwing missiles at the police. At one point a double-decker bus drove past and a brick was thrown at it, smashing its windows. Many people were scared and wanted to stick by the police, who unfortunately were themselves clearly aggravated and stretched to capacity. Rioters stayed on Moor Street for a while and a car was set on fire next to Carrs Lane Church. As I crossed to get to Moor Street Station the rioters headed back shouting “Bullring” and walking in that direction. I was surrounded by masked people smashing rocks, breaking into a snack kiosk and looting it. 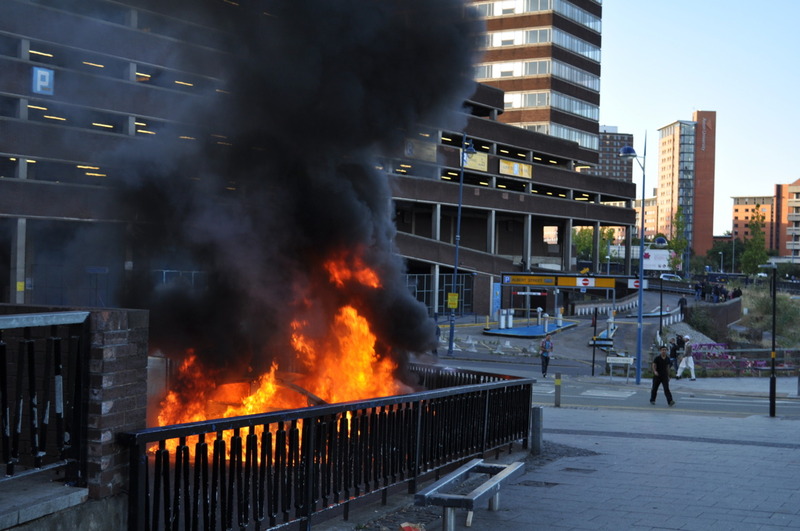 The last I saw before entering the station was rioters and police heading towards the Bullring. By this time the area was very smoky as the car fire had not been quelled. The atmosphere was very intense, in the midst of the rioting crowd there was a sense of chaos and empowerment. They did not seem intimidated or deterred by police presence, just very angry and amused.